Before I moved to Kentucky, I went to grad school in North Carolina. While there, I made lots of amazing friends, and one in particular loved to cook. She always brought the most amazing goodies to gatherings, but her Strawberry Tossed Salad was my hands-down favorite. It's fresh and sweet and crunchy and just plain ol' good at the same time. And Lara was generous enough to share the recipe with me before I moved here. 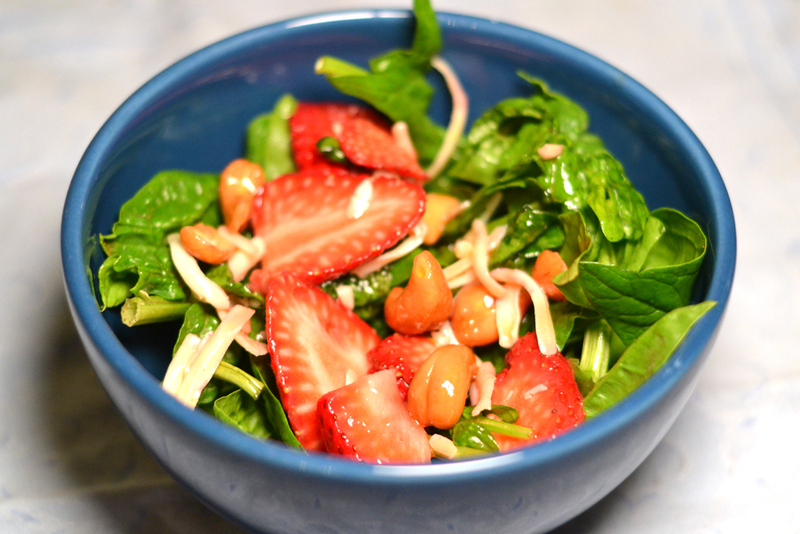 This is extremely lucky for me since every spring I start dreaming about this salad... :-) Go make it yourself before strawberries are out of season! Combine the dressing ingredients in a small bowl and whisk or in a jar with a lid and shake. Let sit for at least an hour, but don't refrigerate it or the olive oil with harden. What a great looking salad! I'm particularly intrigued by the paprika in the dressing - a little sweet heat! This looks delicious! I love a little sweet/savory salad in the spring. That salad would be great with some salty feta crumbled over top, too. Yum! Have a good day Mindy! I made this salad for Mother's Day, and everyone enjoyed it! Great one isn't it! Actually, these people enclose a number of hand crafted as well as handloom items gathered through next to rolex replica sale. When you are buying with this town, you can examine away the actual normal suggestion resulted in jutes, multi-colored Punjabi dupattas as well as scrumptious jellies as well as fruit juices. This is a manual to get to understand concerning the numerous locations where one can obtain particular products. Have you been in to luxurious style? Would you like use of the very best as well as fake hublot watches however the greatest? Should you choose after that you might like to think about attempting MyTheresa. Along with MyTheresa you're coping with the recognized as well as trustworthy organization which has proved helpful it's method in the floor upward to become pressure in the commercial. You are able to choose to visit a few of the competitors, however the drop method lacking what you will obtain whenever you choose to perform your own high-end clothes chanel replica handbags right here. MyTheresa is among the world’s greatest online retailers to visit if you're seriously interested in luxurious style. It's a name which didn't happen simple, and thus the organization functions very difficult to keep the actual standing. The actual shop had been rado replica sale began in 2006. Right now the organization offers small more than sixty workers. Right now this may not really appear to be a great deal, however they just about all possess regions of knowledge that is advantageous. These types of workers tend to be continuously employed in rolex replica uk to ensure they are able to enhance on the merchandise variety.